If you take one thing from this post, it should be, ‘go and visit the Lake District’. Whether you are hiking, motorcycling or cycling, it is well worth a visit. 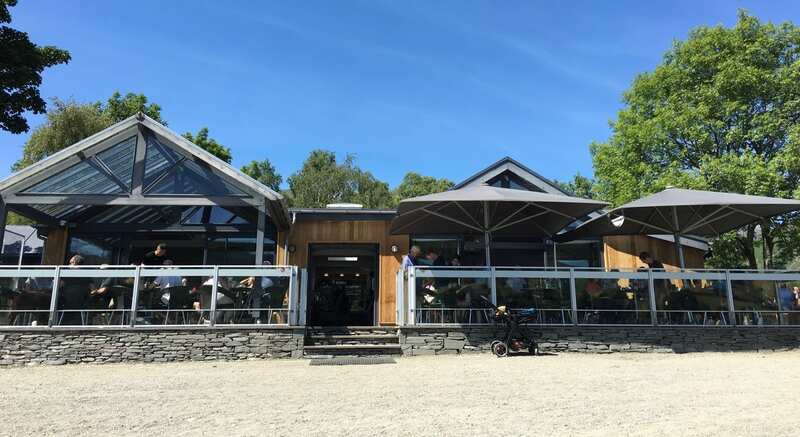 Past stunning scenery, over narrow bridges and flying over wavy roads, you will eventually reach The Bluebird Café, a delightful pitstop for lunch. We found this place through Ride Magazine on one of their routes and were charmed when we arrived. Tucked away on the lakeside, this gem is enclosed on the shore of one of the lakes and thus you are free to sit, watch dogs play in the water, spy on people paddling boats, or even feed the ducks. Not only does this sweet café have ample parking for cars, but best of all, it has many parking bays for motorcycles and my word did they fill up fast! It seemed this was quite a popular stop for us bikers. There are several outdoor tables beside the car park and on the terrace, all of which face the shore. We sat outside as the weather was spectacular and despite sharing a table with another biker, found that we had plenty of space to put our gear down. Inside, the café is spacious and modern however, as the counter to order food is so long, I can imagine that in winter, with queues of people ordering, it will get packed, be super loud and possibly muggy in there. We ordered a chicken coronation sandwich, two slices of homemade cake, coffee and a fruit smoothie. The food came in large portions! Although we didn’t order one, I kept spying on the hamburgers which looked delicious and terribly filling – it was also hard not to pinch one of the chips from the biker with whom we shared our table. Regarding what we did eat, it was all very tasty. Unlike many other cafes of this size and with as many tourists that I’ve eaten at, the food tasted FRESH and homemade. It seemed like everything was locally sourced. The sandwich was packed to the rim, light and perfect for a summers day. The cakes in particular were not too sweet, which is perfect in my opinion. I ordered the ginger cake which was incredibly moist, not too sharp, scrumptious and again came in a huge slice. I think that this café has a charming character. Whether you are sat outside or in, you get a real feeling for what the Lake District is about, after all it is surrounding you! The cakes capture your eyes the minute you walk in to order your food, the food comes in excellent portion sizes, the service is quick, there are FREE dog biscuits and everything was clean – a miracle considering the number of people that were stopping off to eat. I was expecting a rather large bill at the end considering where we were however, it was all very reasonably priced. A final thing that I loved about this place; they anticipate a flow of people on the sunnier days and have opened up an ice-cream/cold drinks stand to avoid everyone going inside to order – an excellent idea! Go to the lakes, have a walk, go for a ride and pop by The Bluebird Café for a spot of lunch. Nice report on the Bluebird cafe but, why not mention there it is, address / postcode ? Know I can google it but so much easier to put it in your report. Hello James, thank you for your comment and your suggestion. I will certainly take it on board as I had not even considered it, and I think it would be very useful to others! Thank you!